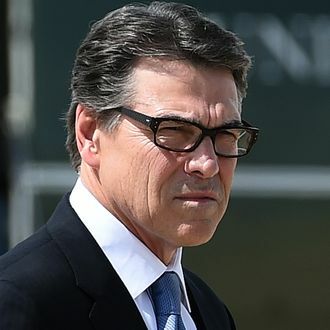 While most Americans were out enjoying the long weekend, Rick Perry, or some person with access to Rick Perry’s personal Twitter account, was stewing over his recent felony indictment. Perry’s two abuse-of-power charges are the result of a showdown with Travis County District Attorney Rosemary Lehmburg, a Democrat who was caught driving drunk last year. After Lehmburg’s arrest, Perry threatened to slash her office’s budget unless she gave her up job. Lehmburg refused to resign, so Perry withheld the money — and that’s why we now have a glasses-free mug shot of the Texas governor. It’s also why we now have the especially dumb beer ad parody that Perry tweeted in the middle of Sunday night. 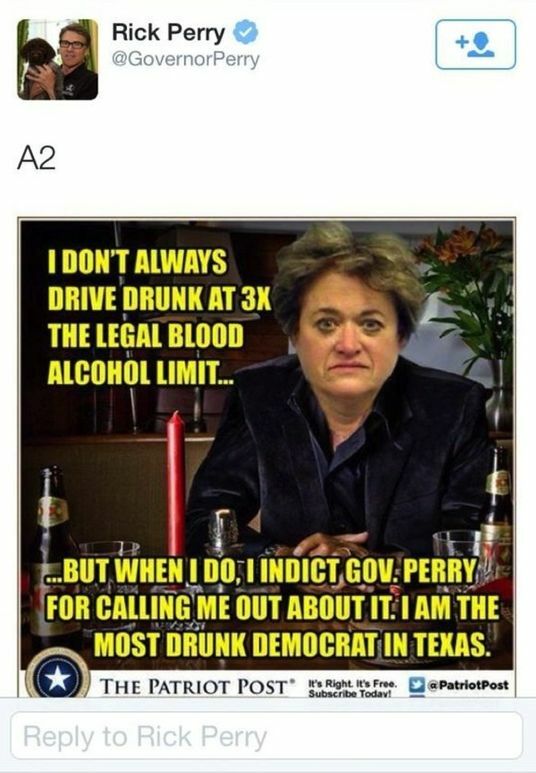 While it’s difficult to say whether Lehmburg is the Most Drunk Democrat in Texas, the Houston Chronicle notes that the post definitely did contain at least one error: Perry was indicted by a grand jury, not Lehmburg, as she recused herself from the case. Anyway, the tweet was deleted shortly after people began noting that it was not in good taste. A tweet just went out from my account that was unauthorized. I do not condone the tweet and I have taken it down. The man didn’t even have the decency to pretend he’d been hacked.